All Out Play Keep is a lovely smaller playhouse which is fantastic value for money. Perfect when space is an issue. It is a 1m x 1m playhouse with a den. The All Out Play Keep is a lovely smaller playhouse which is also fantastic value for money. 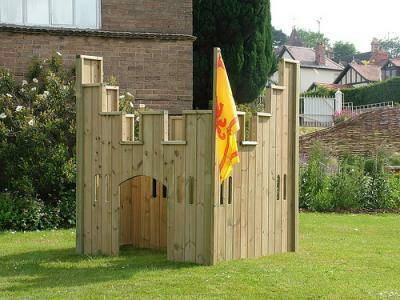 Smaller than the Castle, it is a 1m x 1m wooden playhouse with a den – perfect when space is an issue. The All Out Play Keep can be expanded by linking it to other play houses with a connecting bridge. Choose from the following connecting bridges Fixed, Rope, Clatter, Net, Dowel handrail, Crenelated handrail, Arched, Sloped, Tube. A slide can be added, available to purchase separately. Flag not included, available to purchase separately. 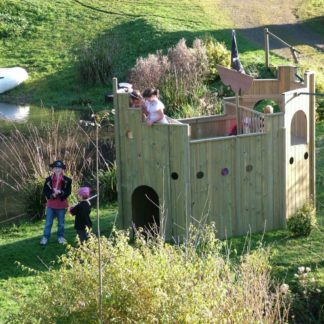 All Out Play structures are craftsman built from 15mm tongue and groove, non-toxic pressure treated premium grade Redwood Pine timber throughout which is only sourced from fully managed, renewable plantations. All fixings are stainless steel or coated to prevent rust and corrosion, and all bolts are domed and/or countersunk for safer play.